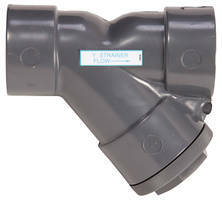 Y-Strainers are designed for vertical or horizontal installations. Available in five standard sizes from ½ in. to 2 in. with Cv values from 4.0 to 2.8, Y-Strainers feature 1/32 in. screen perforation or a 316 stainless steel mesh. With 2:1 open area ratio and hex cap for easy screen access, units are used in pumping or chemical-feed equipment. Strainers are made of PVC, clear PVC and CPVC with NPT materials. Griffco Valve, Inc., Amherst, New York, announces the introduction of its new line of Y-Strainers designed to enhance the performance of chemical feed systems. Designed for horizontal or vertical installation, the addition of a Griffco Y-Strainer to the suction (inlet) side of a chemical feed pump will prevent debris from entering the pump and clogging the check valves or damaging the interior of the pump head, according to the company. Available worldwide from Griffco and its distributors, the new Y-Strainers are made in the USA and feature a standard screen perforation of 1/32”, with other perforation sizes or a 316 Stainless Steel mesh, available on request. Materials of construction include PVC, clear PVC, and CPVC with NPT, BSPT or Socket connections in five standard sizes from 1/2” to 2” (DN 15 to DN 50) with Cv Values from 4.0 to 28. The new Griffco Valve Y-Strainers have a 2:1 open area ratio and hex cap for easy screen access, the company states. True union, flanged, and European connections are optionally available at extra cost. Privately held and established in 1993, Griffco Valve is an ISO-certified manufacturer of high-quality chemical feed accessory equipment for pumping and chemical-feed systems. Products include back pressure valves, pressure relief valves, calibration columns, pulsation dampeners, injection valves/quills, corporation stops, gauge guards, and other chemical-feed accessories. For more information, contact Griffco Valve, Inc., 6010 N. Bailey Ave., Suite 1B, Amherst, NY 14226 USA. 1-800-Griffco (1-800-474-3326) toll-free in the USA and Canada; International +1-716-835-0891. Email: info@griffcovalve.com. www.griffcovalve.com.